Also compatible with the new HDMI 1.4 and 2.0 specifications. This product is a professional quality, multiple-shielded digital interconnect HDMI cable to connect your HD video source components (eg. Blu-Ray, games consoles, 3DTV sources, etc) to your plasma, LCD or LED TV or projector. Fully compliant to the HDMI 1.4 and 2.0 standards, with the result that they will give you pin-sharp imaging and crystal-clear sound with Full HD 1080p resolution and beyond (up to 2160p) - plus these are the only version of HDMI cables that will give you full 4k UHD and 3DTV pictures and sound! These cables can also be used with other HD Ready and Full HD equipment at resolutions of 720p, 1080i and 1080p and they are "future-proof", with support for "Super-HD" resolutions of up to 2160p for 4k UHD TVs. 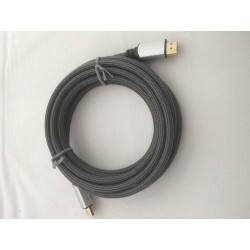 These cables are ideal for use with Bang & Olufsen's BeoVision Avant TV's. Fully compliant to HDMI 1.4 and 2.0 standards. ​This cable is solidly made to ensure that each one works perfectly every time. These cables will give many years of excellent service and are robust to withstand the rigours of either home or professional use! You can connect your B&O BeoVision to a HTPC or computer with our HDMI-DVI adapter - turn your BeoVision into a Smart TV!